But the M makes it Mine as well. This was a strange one, no doubt about it. Ok, that’s officially one of the coolest trees I have ever seen :). A closeup of this could have served as one of your mystery pictures. And it would have been a hard one for sure!! Maybe it’ll inspire you to do an occasional post in your suspended series. I don’t see it in the near future, but maybe one day. I’m too addicted to reading right now :). Reading’s a good addiction: I’m an addict too. That’s a good way to put it. There are people like that, too. We could use these two pictures to emBark on a photo project. wow. there’s so much texture! it prompts one to reach out and touch it! I don’t think I’d ever seen texture of this sort in the bark of a tree. Agreed. I wonder how often this phenomenon occurs in redwood trees. The subtle colors are as beautiful as the bark is unusual. “Corrugated” is just the right word. I wonder if Jamie Wyeth was inspired to start painting on corrugated cardboard after seeing a tree like this. Probably not, but he surely would have appreciated this example of nature’s artistry. Speaking of the Wyeth Family, in the Dunedin Public Art Gallery (=Museum) today we saw a painting whose accompanying placard said that the painter was influenced by Andrew Wyeth. How could I miss with a subject so compelling? I love the texture and the combination of dark and rich browns. I see an owl. 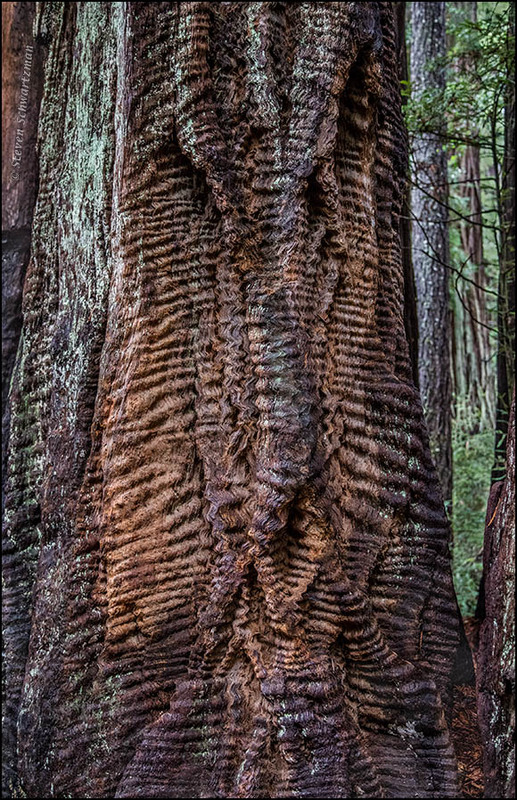 Coincidentally, we were watching a nature program the other night and it had a brief view of a similarly corrugated redwood tree. Maybe the corrugation isn’t so unusual for this species. Now that you mentioned an owl, I can sort of see it. Probably a Curly Redwood like the wood a motel is built from in Crescent City.